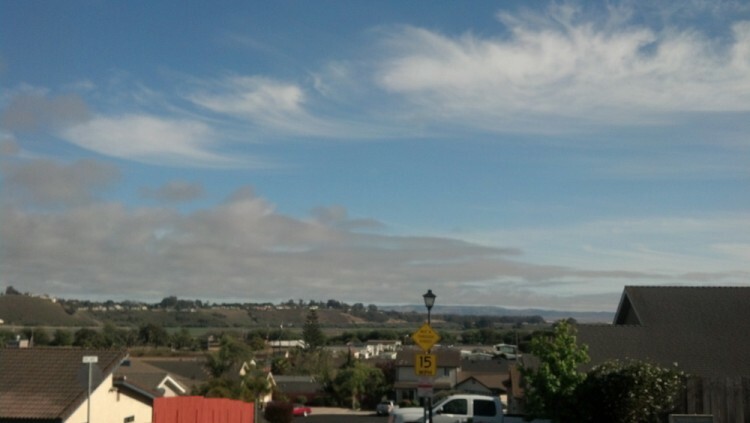 It’s Memorial Day– May 25, 2015– and as is common along the California Coast, we have low clouds from the Ocean. It’s normal. But even more common are the high clouds above…cirrus clouds spawned by jet aircraft. How can we be sure jets made these clouds? As any skywatcher knows… just watch. Over a period of an hour or two you can observe the contrails from jet air traffic thicken and widen, merge together, and morph into various dusty shapes. Today we watched a moderate-level contrail day cover around twenty percent of the sky– not much, relatively; on some days artificial clouds (“chemtrails”) cast a shadow over millions of square miles. For this to happen, enough condensation nuclei have to be present in the path of the aircraft to provide a substrate onto which the water can condense. Super-heated water vapor instantly freezes in the sub-zero temperatures at around 30,000 feet, creating expanding ice crystal clouds. Notice that the higher clouds are brighter, mostly because they are reflecting more sunlight due to their higher altitude… up to about 40,000 feet. In addition, silver iodide added to the atmosphere makes jet-spawned clouds even brighter. (Silver iodide is made from silver nitrate, which is used in film due to its extreme photosensitivity, and potassium iodide). Even though the high, cirrus jet clouds appear to be very close to the lower clouds, they are actually much higher and much further away. Contrails can also form without artificial condensation nuclei from weather modification activity. When humidity is high enough the moisture itself, in the form of ice crystals, provides the nuclei for cloud formation.